As you drive by the fields and pastures of the eastern Great Plains between May and September, you notice certain birds perched on the fences and power lines. Two species will look somewhat similar because each has a black "V" on a yellow breast. The robin-size one with a long skinny bill and white outer tail feathers will be one of the two species of Meadowlark. The sparrow-size one with the typical finch's seed-cracking beak will be a Dickcissel. Both will commonly sing as you go by, but the songs are totally different. The Eastern Meadowlark has a clear, descending, melodious whistle. The Dickcissel, on the other hand, makes two or three dry chirps followed by a trilled yerp-yerp-yerp. If you can sit and listen, he will sing all day long. 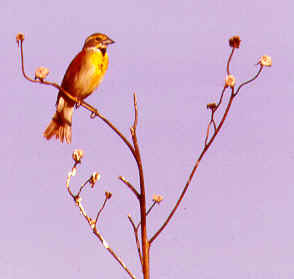 In fact, the male dickcissel does little other than feed himself and try to attract a mate. The female is totally responsible for building the nest, incubation and feeding the young. Dickcissels typically make a woven grass cup type of nest in short woody vegetation or on the ground. They will often nest twice in a season. The young of the second brood may not fledge until August, making the dickcissel a very late nester for the prairie. Dickcissels winter from southern Mexico to northern South America. Summer on the Great Plains would be incomplete without the song of the dickcissel!